GL2GO is an innovative long distance calling app developed for smartphones by the product experts at the Group of Gold Line. By combining Gold Line’s great prepaid long distance rates with an easy to use application that connects to an existing address book, GL2GO makes calling long distance more convenient and cost effective than ever before. 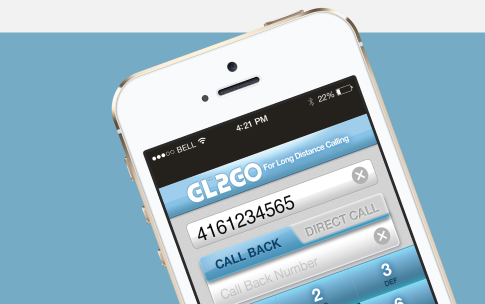 GL2GO streamlines the dialing process; customers no longer have to enter access numbers, PINs or destination numbers. GL2GO automatically dials access numbers and PINs and allows the user to connect to their existing address book. It’s the perfect solution for customers on the go. A. Allowing GL2GO to convert outgoing calls to incoming calls. It’s an innovative way to get the most out of cell phone plans with unlimited incoming calls. B. Allows travelling customers to select a local landline number as their “Call-Back” number in order to avoid paying high domestic and international roaming charges. Set this option and never have to recharge your account again! This option gives you the ability to set a desired recharge amount for your GL2GO account whenever you reach a preset minimum balance. You will never have to worry about running out of minutes.